Pressure Cooking Today will receive some commission. A Pressure Cooker Pork Stroganoff with tender strips of pork in a rich, creamy gravy that’s kicked up a notch with a little chili sauce, dry mustard and sherry. Sigrid, a long time Pressure Cooking Today reader, recently sent me a kind, supportive email about a negative comment I received on a recipe. In the email she also shared one of her favorite recipes, a Pork Stroganoff recipe. She found the recipe in a Parade magazine many years ago. It’s become one of her “go to” recipes. She makes it frequently for guests and it’s a big hit. The original recipe was a stove top recipe, but she thought it would make a great pressure cooker recipe as well. With such a rave review, I definitely had to give it a try. The original recipe called for pork shoulder, and Sigrid likes to use pork shoulder steaks. I had a pork sirloin tip roast in the freezer, so I used that instead. An Instant Pot is one of the most popular brands of electric pressure cookers. 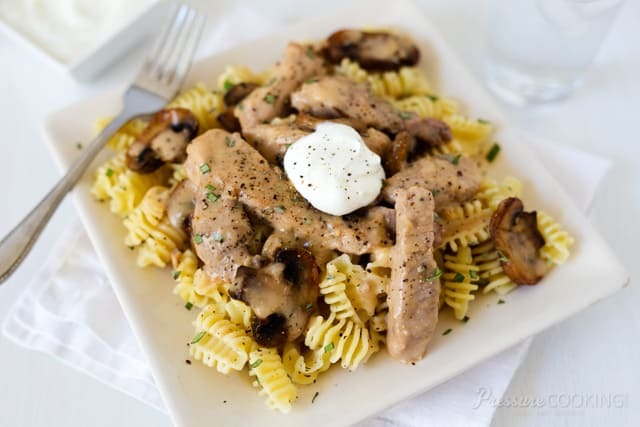 They are easy to use and your Instant Pot can help you create this delicious Pork Stroganoff! Pork sirloin tip roasts are generally a little more tender than pork shoulder, so be sure and taste your pork to see if it’s tender after five minutes cooking time. If not, just lock the lid again, and cook it for a few more minutes. When the food in the pressure cooker is hot, it will come back to pressure quickly. 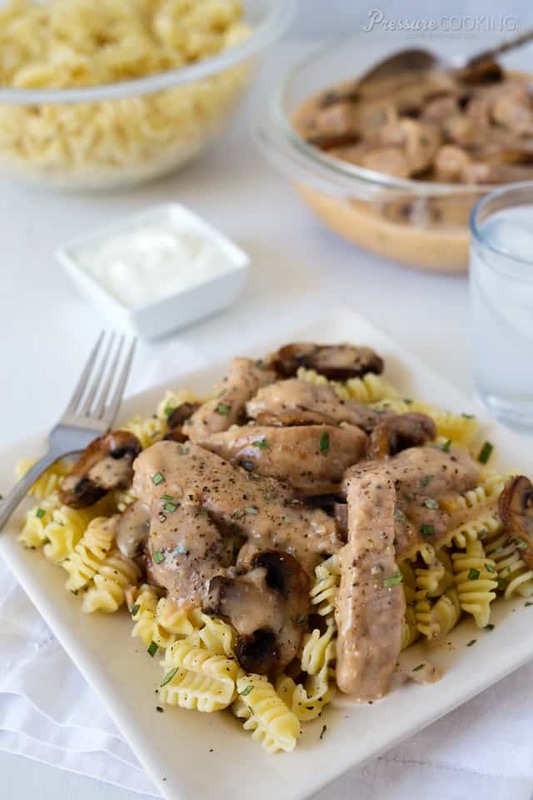 This Pressure Cooker Pork Stroganoff was a big hit with my family too. Thanks Sigrid for sharing it with us! Trim excess fat from pork and cut into thin strips ½-inch wide. Season pork generously with salt and pepper. Put 1 tablespoon oil in the cooking pot and select browning. When oil begins to sizzle, brown meat in batches until all the meat is browned - do not crowd, add more oil as needed. Transfer meat to a plate when browned. Select sauté; add the onions and cook, stirring frequently, until the onions soften and begin to brown, about 3 minutes. Add sherry to deglaze the pot; scrap up any brown bits on the bottom of the pot. Add chili sauce and mustard. Add chicken broth, browned pork and any accumulated juices. Select High Pressure. Set timer for 5 minutes. While the pork is cooking, heat a large sauté pan over medium-high heat until hot. Add 1 tablespoon oil and butter. When butter is melted, add the mushrooms and cook until golden. (I cooked them in two batches.) Season with salt and pepper. When beep sounds turn pressure cooker off and let the pressure release naturally for 10 minutes. After 10 minutes use a quick pressure release to release any remaining pressure. When valve drops carefully remove the lid. Combine the cornstarch and water, whisking until smooth. Add cornstarch mixture to the broth in the pot stirring constantly. Select Simmer and bring to a boil, stirring constantly until sauce thickens. Add 1/3 cup of gravy to the sour cream and mix until well combined. Add the sour cream mixture to the gravy and stir until well blended. Stir in the sautéed mushrooms. Add salt and pepper to taste. **While stroganoff is cooking, put salted water for noodles on to boil. Follow package directions for cooking noodles and time their cooking to finish at the same time as the pork. Drain noodles. Serve stroganoff over noodles sprinkled with poppy seed (optional). *I use pork shoulder steaks. Other pork can be used but I think pork shoulder is more moist and flavorful than pork chops or other pork. And a nice bonus - they’re less expensive. You can use any canned chicken broth, but I find Swanson’s, by far, the closest to homemade in taste. The sherry, chili sauce and dry mustard add critical elements to the flavor of this dish. Do not be tempted to omit any of them. I use the Heinz brand of chili sauce. I was just looking at your pressure cooker version (thank you again for creating it) of my favorite pork stroganoff recipe from Parade magazine. I’m thinking that except for saving a bit of time one could sauté the mushrooms in the pressure cooker after browning the pork. I’d add a bit of butter to the sauté as you did as butter makes sautéed mushrooms tastier. I’d still remove them after the sauté in the pressure cooker and add them later as you did. Now, if I can figure out how to successfully cook the noodles in the pressure cooker at the same time as the rest of the ingredients pressure cook without overcooking them. I just successfully did that with a ground beef stroganoff recipe. I used 8 oz. of wide egg noodles that were placed on top of the ground beef , onions, mushrooms and other ingredients and “pressed” into the liquid so that they were submerged. In that recipe 3 cups of beef broth were used. This recipe calls for 1 cup of broth and 2 ounces of sherry so I’d definitely need to increase the liquid – probably to slightly less than 3 cups of broth. Pressure cooking time is identical on the pork stroganoff recipe and the ground beef stroganoff recipe – 5 minutes. However once the pressure cooking time has ended the pork stroganoff calls for 10 minutes of natural release before quick releasing the remaining pressure. The ground beef stroganoff recipe called for only a 2 minute natural release followed by a quick release of remaining pressure. The question is, would the 8 minute difference in natural pressure release time result in really mushy noodles? One solution might be to use a type of pasta requiring a somewhat longer cooking time than do the noodles. I hope I can figure this out as the pork stroganoff recipe is much tastier than was the ground beef stroganoff. The latter was okay, but not wonderful – in fact not tasty enough that I’d make it again – though the cooking technique worked very well. Hi Sigrid – you can definitely saute your mushrooms first and set them aside if you prefer not to dirty a skillet. For me, sauteing the mushrooms separately means I can get the pork cooking more quickly and have more surface area to brown the mushrooms. For most dishes, I’m not a big fan of cooking noodles in the gravy because the noodles absorb so much gravy that leftovers aren’t as creamy and delicious as the first day. When I make chicken noodle soup, I prefer to keep the noodles separate from the soup for the same reason. However, I know many people are looking for one pot meals where they can cook the noodles with the meat, so I’ll look forward to hearing your results. I think you’re on the right track with increasing the broth, but I assume you’d want to increase the sherry, the chili sauce, and mustard as well so the sauce is flavorful. I’d try the 5 minute cook time with the 2 minute release so you don’t over cook the pasta (you could use smaller pieces of pork to compensate if necessary). I think I will omit the chili sauce and sherry. I never have cooking sherry on hand. I never use corn starch either, I usually use flour. So how much flour do you think I should use? You’ll probably need about 1/4 cup of flour. Of course one can omit most any ingredient from a recipe, but if you omit the chili sauce and sherry it will make a taste difference in this recipe. I know, I tried once when I didn’t have all the ingredients in the recipe and it wasn’t nearly as good as it is with all the called for ingredients. By the way, I recommend never using cooking sherry or cooking wine of any kind. They’re terrible and all have salt added to them. Buy the real thing. There must be a way to do this and cook the noodles in the pressure cooker at the same time. Hi Brandon – if you wanted to you could cook the meat most of the way and then add the pasta and finish cooking – typically pasta cooks in 1/2 the time listed on the box. You’d also have to adjust the liquid amount to account for what the pasta would absorb and then adjust your cornstarch slurry at the end. Or, you’re looking to avoid dirting another pan, or save water, you could always cook the pasta first, remove it to a bowl and then it would warm up when you added it to the hot sauce. Had to let you know that we tried the Pork Storganoff last evening and it was a hit. Unbelievable how tender the pork was! Thank you for sharing this recipe. Hi Sandy – yes, you can use pork loin chops or loin roast, but you’ll get a better flavor with something a little less lean. Just what I was looking for! Sounds so good. Hope I have some dry sherry in the pantry. Do you think it would work with cubed pork steak? Bought several packages the other day………Smiles! Could you make it with cubed pork steak? I suppose you could Kathy, but I don’t think I would. I’d just pop the cubed pork steak in the freezer or wait until I purchased some actual pork steak to make the stroganoff. I too have made pork stroganoff on the stove top…never in the pressure cooker thought. That will change. This looks amazing. I love the different additions too-chili sauce and sherry-who knew? Not me-but I do now. This will make a wonderful meal for us soon. Did you use the Instant Pot or normal pressure cooker? I had to give it 28 mins in the IP because the pork shoulder steaks, which had been sliced as per recipe were not cooked at 20 minutes. We have no simmer function on my IP. Hi Hazel – my recipes are written for the electric pressure cooker, including the Instant Pot. The simmer setting on the IP is just saute adjusted to less http://www.pressurecookingtoday.com/instant-pot-duo-and-smartcooker/ Were your steaks sliced into 1/2 inch strips as indicated in the pictures? Yes as far as I was able to! Make better tasting meals in a fraction of the time using today's modern, easy-to-use electric pressure cookers. On Pressure Cooking Today I share great tasting, easy-to-make pressure cooker recipes. ©2012—2019 Pressure Cooking Today™ / Barbara Bakes™ LLC. Design by Purr.